Adventure Game Studio | Games | Ben There, Dan That! Download Ben There, Dan That! 'Ben There, Dan That!' 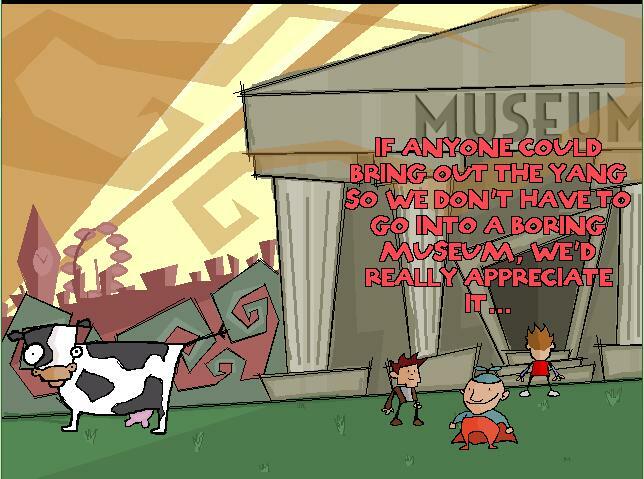 is a freeware comedy adventure game by Zombie Cow Studios, written by and somewhat-narcissistically starring the eponymous Dan and Ben, a couple of layabout geeks who always seem to find themselves knee-deep in high-adventure. "An amusing first offering from Dan Marshall and Ben Ward that features colorful, low-detail graphics reminiscent of comic book art. The only real drawback to the game would be that it suffers from the 'many rooms, few interactions/strange puzzle solutions' issue that many new authors fall into, though this should not deter you from playing and enjoying this game! " Best AGS games ever. I had to buy TGP on Steam after playing BTDT. The quality of both of these games is unreal! BRILLIANT game. A joy and a laugh from start to finish. Funny writing, quirky characters (both main and minor) and the cartoonish style didn't (as so often happens) make the puzzles totally illogical. They were challenging without being fustrating, which is always what you need. I heartily also recommend the sequel which is actually even better than the first one. If any more are ever made in the "Ben and Dan" series, I will be among the first to download them. This was a frickin' excellent game! Absolutely hilarious and the whole thing was really polished. Highly recommended, and the sequel looks even better. A good adventure either needs a gripping plot or just be really funny. And if ya see the image that is tagged next to the game, it is probably quite obvious which category this game falls into. Funniest game I have played in ages, possible the funniest. I probably clicked every possible combination of dialogue in this game just to read it all. There is an easter egg in this game which is just amazing! The 'Kate Winslet' of the AGS Awards - 7 nominations and not a single award. (Shame there isn't an award for best comedy). Don't worry Ben and Dan, like Kate, I'm sure your time will come. Great game - these guys are comedy geniuses, even managing to demonstrate the art of perfect comic timing in some of the banter. Easily a 4 or 5 cuppa in my book. If you have a sense of humour you MUST play this game! This game was literally laugh out loud funny - so much so that my wife told me to play it in the other room so that she could work! I know people don't usually like to admit to how long it took them to complete games (especially if they have been playing them at work) but I took about 7-8 hours to complete this - mainly because I took the time to smell the loo cakes. Could maybe do with being re-rated now the gameplay has been improved with keyboard shortcuts. Well done Ben and Dan - can't wait for the sequel. Weird characters, weird story... and incredibly funny. I think this is the funniest parody on the adventure genre i have seen yet. It's really strange that if a puzzle is to simple, Ben simply says what to do. One thing i didn't like is that a lot of characters are simply there for funny dialogs, but have no relevance for puzzles. I enjoyed it, even if I didn't understand everything. Ben and Dan are really too talky ! But I like the original graphics (difficult to see what an object is, in fact). One of the best AGS games, and an excellent game on its own right. Sarcastic without being cynic. A parody of adventure games that stands on its own. Some of the best dialogue and the highest interactivity you'll find in an adventure game nowadays. Make sure to try random item combinations and actions, our heroes will have something unique to say in most occasions. Ignore the reviewer from the AGS panel, he or she probably hasn't played DoTT or any other LucasArts game, based on his/her comment. Really a fantastic effort. The writing is really what makes this game great; the puzzles were generally well-designed (though occasionally a bit out there) and the graphics were attractive overall. The only thing I didn't like was the interface, but it doesn't even come close to ruining the experience. I absolutely recommend downloading and playing this game. Tee hee, lots of naughty humour! This game was a lot of fun to play. Liked it very much! most def worth playing! A very clever and well put together game. The dialog clearly stood out as it's best feature, but it also was able to maintain consistent background/animation art. The music was catchy. A thoroughly enjoyable experience. This game was great. A colourful, funny and well-executed adventure yarn. Good use of AGS. The graphical style in this game is really admirable, and the writing and puzzles are solid. Great game! 3 cups? Wow. I mean I know I'm not as impartial as I could be since I've met Dan + Ben before, but browsing the other games that have scored 3 cups and some that have scored 4, have to say I'm very surprised! Great Game! I enjoyed this a lot; the talk was funny and the puzzles cool - a bit strange sometimes, but I didn't need any hints. Amazing, really funny! Great dialogue, perfect puzzles and fab graphical style! Made me grin like an idiot the whole way through :D Just fabulous! This is the best adventure game I have played in a long time, definitely up there with the Lucas Arts classics in terms of dialogue, and the puzzles made sense, so I wasn't held up trying to figure out something incredibly obscure. It's a nice length, too. Took me maybe 6 or 7 hours to get through.